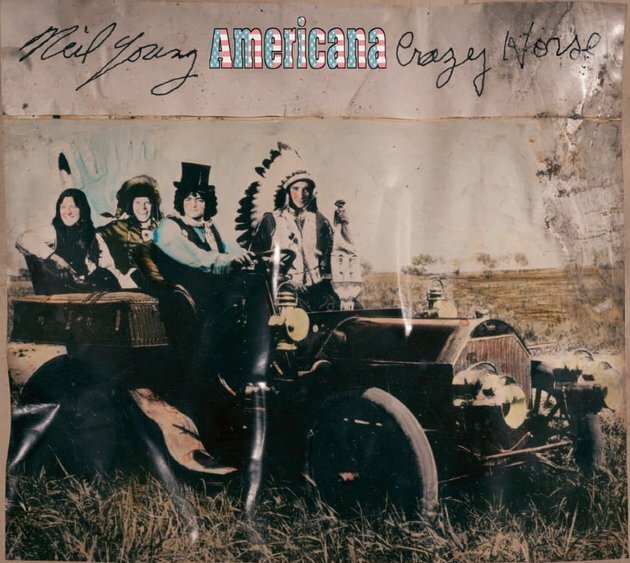 If you care at all about hard-driving guitar, bass and drums rock ’n’ roll in its most essential and elemental form, a new album by Neil Young and Crazy Horse can’t be anything but a gift. Yet the long-may-he-run legend’s 34th studio effort, his first with the band that’s always been his ideal vehicle since the theatrical epic Greendale in 2003, is throwing some fans and critics for a loop. This, you see, is an album of covers, which is not in itself the curve ball; remember the brilliant take this crew had on “Farmer John” from Ragged Glory? The twist is what Young has chosen to cover on this 11-song set. The intensity of these readings is part of what separates Americana from some of the other “songs-we-grew-up-with” nostalgia rides that some of Young’s peers have produced in recent years, from Paul McCartney’s good-time Run Devil Run set of ’50s rockers, to Bob Dylan’s recent forays into the Christmas and pre-rock Tin Pan Alley canons. But an even bigger factor in making this a worthwhile endeavor is the sheer joy of listening to Young hit his groove with Crazy Horse survivors Billy Talbot, Ralph Molina and Frank “Poncho” Sampedro (with a little extra help from Pegi Young and Stephen Stills on backing vocals). Yes, Crazy Horse has rocked harder in the past; many of these tunes settle into a folkie mid-tempo groove. Nevertheless, hearing Young interact with Sampedro with those wonderful grungy guitars and ride Talbot and Molina’s simple but solid rhythms is one of the greatest sounds in rock. And there’s a sheer electric thrill when they hit their stride, notably on the full reading of Woody Guthrie’s often-co-opted “This Land Is Your Land” and a surprisingly vital “Jesus’ Chariot (She’ll Be Coming ’Round the Mountain).” Even the songs that fall a little flat—including, surprisingly, the Silhouettes’ doo-wop hit “Get a Job”—never completely let us down. Would it have been more fun to have a full album of garage-rock covers a la the aforementioned classic by the Premiers? Heck, yeah. But I’m happy nonetheless to be spinning Americana on repeat.